Day Three of Around the World Week brings us to Wales, and the company of Stephanie McAlea, Stygian Fox. Artist, writer, designer, and all-around-great person, Stephanie joined with my friend Darren Pearce and Colin Dunn to craft a system-agnostic source of really cool modern-day items imbued with magical powers. 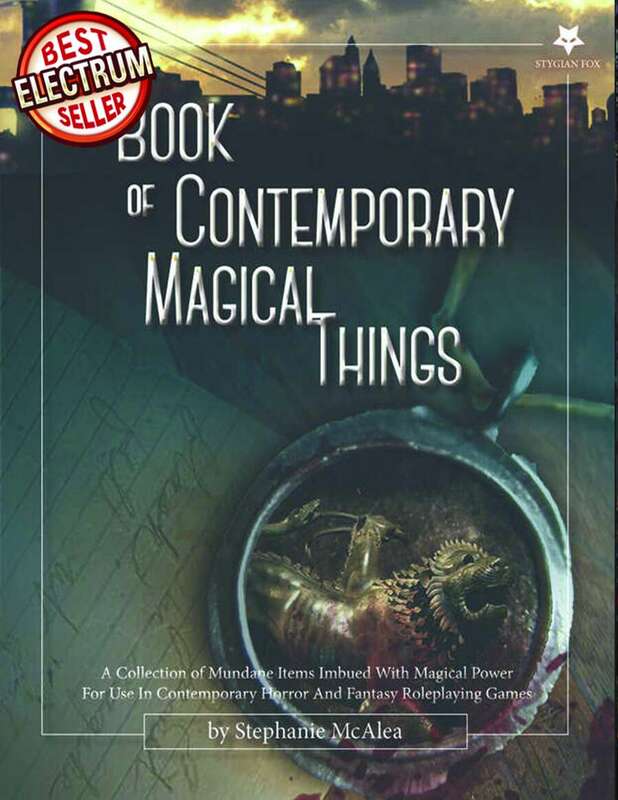 The Book of Contemporary Magical Things is a ready-to-hand kind of sourcebook for any GM running modern day urban fantasy, horror, supers, or related types of settings. The Book of Contemporary Magical Things is 134 pages of modern, seemingly mundane, items that are imbued with magical power. Some are quite minor; A tuning fork that will quiet a room, a pair cufflinks that tell you the name and family details of those with whom you shake hands, a set of polyhedral dice that temporarily change the fortune of the roller, but some are spectacular, or dangerously malevolent. From minor items to Earth shattering forces, these items are there for you to use as a Gamesmaster in your modern, horror, or superhero campaigns.